PawPurrry: The Accidental Show Dog - Let The Training Begin! Our first time at dog show handling class was a family affair, we all jumped into the car and off we went, having no idea what to expect! The first challenge was the equipment. I naively thought we were good as we had a lead and collar, but we just had a chunky lead that even had a poop bag attached. I was to discover everyone else had very nice dainty leather ones, attached to dainty correction chains. We looked a bit out of place. Luckily, some kind people lent us equipment for our first night. I asked where we could get what we needed and was told you get everything at the dog shows. It seemed like a chicken and egg scenario as we hadn't been to our first show yet. The next challenge was for Snoopy to show his teeth to the instructor, as this is something they have to do for the judge. Snoopy wasn't at all keen on showing his teeth and kept trying to bite her... and me too when I tried. We had a lot of homework to do! supposed to stand on my foot! 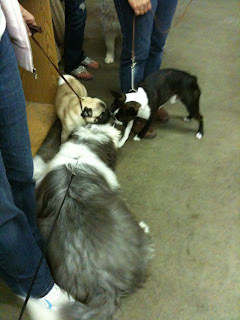 Snoopy thought show class was great fun, he just wanted to play with all the other dogs and it was quite a challenge to make him concentrate in those first few weeks. Everyone else seemed to know how to do everything, we really were the new kids on the block. I allowed him to play when we were waiting and then he was good about switching it on and performing when he needed to. I think Snoopy is definitely the most disruptive dog at the class, but he's only a puppy and I wanted him to have fun. I guess we just didn't take it as seriously as maybe some of the other people, ooops! His favourite bit was at the end when the dogs had to go around the ring with everyone else clapping, Snoopy just trotted around as though he'd won. 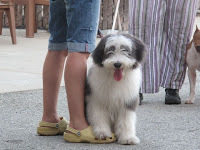 As part of the training process everyone was using treats for the dogs, but I'd already broken the cardinal rule of dog shows and taught Snoopy to sit, sitting isn't required at all in the show ring, so this wasn't going to work! I had to resort to using the old fashioned praise and tickle on the ear approach. We'd agreed to do a show at the end of November if Snoopy was ready, but by October Jean was talking about a show in Napa that Snoopy's siblings were entering early in November. We entered (which was no easy process) and thought it would be a great day out and a chance for Snoopy to see his brother and sister. Lots of people at our class were also entering the Napa show and they asked me who was showing Snoopy, when I said I was they seemed surprised, but then encouraging. It seems you can pay a professional handler to show your dog, but for us this was just fun and we didn't want to spend the money. It was fun until people said they'd come and watch us at the show when they weren't showing their dogs and critique us, now I was getting really nervous. Hee hee! 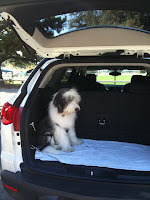 I showed Cosmo (Havanese) myself after taking a handling class too!! It CAN be done! I met tons of great friends from that experience who are NOT professional handlers! Good luck!